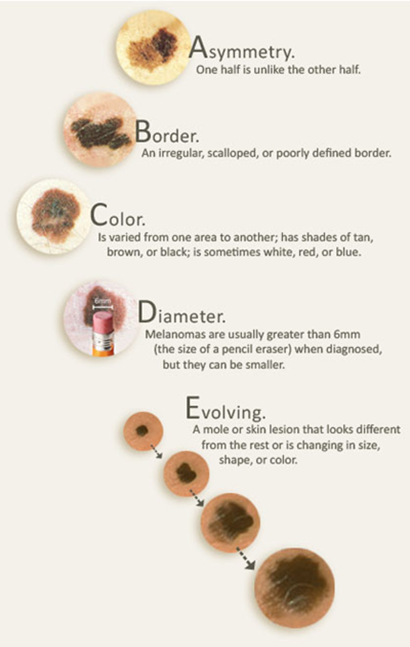 The key to successfully treating melanoma is recognizing symptoms early. You might not notice a small spot if you don’t look carefully. Even if you have carefully practiced sun safety all summer, it’s important to continue being vigilant about your skin in fall, winter, and beyond. Throughout the year, you should examine your skin head to toe once a month, looking for any suspicious lesions. Self-exams can help you identify potential skin cancers early, when they can almost always be completely cured. Use a hand mirror to check hard-to-see places. Call your doctor if you notice anything unusual. Have yearly body checks by a dermatologist, and examine your skin once a month. It is so important to catch melanoma, the deadliest form of skin cancer, early that physicians have developed two specific strategies for early recognition of the disease: the ABCDEs and the Ugly Duckling sign. If your doctor thinks you might have skin cancer, that piece of skin will be removed and sent to a lab for examination under a microscope. This is called a skin biopsy. 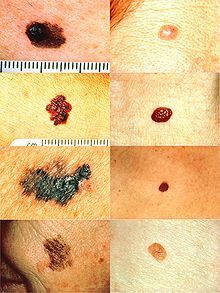 There are different types of skin biopsies. All or part of the growth will be removed. Once melanoma has been diagnosed, CT scans or other types of x-ray tests may be done to see if the cancer has spread to other parts of the body.